1. Preheat a griddle or barbecue. Cut 2 of the avocados lengthways into 4 thick slices each, removing the skin and stones as you go. Drizzle all over with 2 tsp oil, 1 tsp zaatar and some seasoning. 2. 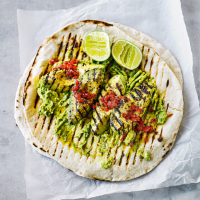 Cook the avocado slices and the whole chilli on the hot griddle, or barbecue for 1-2 minutes each side, or until well charred. Keep warm. 3. Meanwhile, peel and stone the remaining avocado and mash with half the lime juice and seasoning. Finely chop the chilli, discarding the seeds, white membrane and stalk, and mix with the remaining oil, lime juice and zaatar. 4. Warm the flatbreads on the griddle or barbecue. Spread with the mashed avocado, top with the charred avocado slices. Drizzle over the dressing and serve with extra lime wedges for squeezing over. This recipe was first published in Tue Jul 10 10:30:00 BST 2018.